Snowy. Watched indoor baseball game. Also bought a bag of candy from Brick. Tok and ate it during the game. Snowed a little. Cool. Was in sick room with a head ache half the day. Mama and Lulu came up to see me. -cool but clear. In after noon went hunting first shot and killed a sparrow. Snowed hard. moved in summer Chaple. Had 2 hours detention. Was palm Sunday. Was warm. Went down town for dinner with mama and Lulu. Cool but clear. In After noon went down lake bank with Hustice and played. Cool rainy. Played with Bud Nixon in cave and plases on the lake bank. Also had play battle with weeds with Bud Nixon. Warm and clear. Was Easter. Threw eggs down lake bank. Went down town for dinner. Mama and Lulu were up for Chaple. Warm and clear. In after noon had detention and couldent play. After dinner I walked cliffs on lake bank. Warm and clear. Was half holiday. Had ½ hours detention. Went down lake bank and made raft with Hustice. Dident have pirmition down lake bank and got 10 hours detention for it. Slightly cool and cloudy. had militairy drill and banut exercises on campes. We had our uniforms on. Had detention all day and was on detention drill. Warm and clear. Had detention all after noon. In evening there was a college party. Danced nearly every two step. Cloudy but warm. was on detention drill all day. Billie Backer fanted in Chaple at night. Was half holiday.Was warm and clear. Hillis Gillitte and my self played around the corn field. Played Pirate with spears. Had a bottle of pop and a jelly rowl and some candy. Warm and clear. Watched the first out door baseball game of the year. The first team played down town team. We beat 18 to 8. Buckingham pitched for us. Cool and rained a little. In after noon went hunting with Mr. Robinson Hustice and Prat. All of us together killed 7 robbins. Had them for supper that night. Warm and clear. In after noon, Willis, Bud Nixon, and my self, chased Handtman with sticks. He had a fort in one of the buildings. Warm and clear. In after noon had military drill on campas. Company A, had there campeign hats and leggings on. Had one hours detention. After detention I went out on campas and played catch with Hawthorne. Warm and clear. In after noon watched first out door baseball game of the college. We beat 25 to 5. Warm and clear. Was Monday. A half holiday. Went after gofers with Handtman and Hustice. Handtman caught one. Warm and clear. Was quite hot. In after noon I played Cricket with some of the boys and Mr. Stubs. We were beaten. Very warm and clear. Had 6 hours detention drill all day. In evening at 8 oclock the college gave the choir boys a supper It was fin 2 uncertain words. Cool and fogy. In after noon had military drill on campas. I had ¾ of an hour detention after detention. gillitte took me up to miss Cotters room and gave me a pear of cack bad and an orange. Warm and clear. hat military drill on campas in after noon. I saw a big car fary on the Lake with 14 cars on it Had some detention. Warm clear. In after noon The College baseball team played the North Green Field team and beat 8 to 9 in our favor. Was Sunday. Will be the last Sunday down town for dinner Had a good time. Came back for wash room. Was cool and clear. Was Monday half holiday. In afternoon went down town and develiped some pictures from some plates of Coffins. Cool and clear. In after noon we marched down town and Company B had campeign hats and leggings on for first time. Was very tired when I got back. Warm and clear. Was hole holiday. It was field day. Clark H and my self were tie in the high jump. We have to jump over again for the medal on Saturday. Was saturday. In after noon there was a big baseball game on campas. We were beat. It was warm and clear. Cool and clear. Was Sunday. Was up at euluige all day. In after noon went to library and wred. Rainy and cool. In evening I got hair cut. Cool but bright. The 2ed. team played downtown team. I had detention for an hour and a half. In after noon went down town with Mr. Stubs and got a pare of patent lether slipers. In evening went down to high school to enter tanment. Cool and clear. played around, had bamination in Latin. Went over to Teds house. 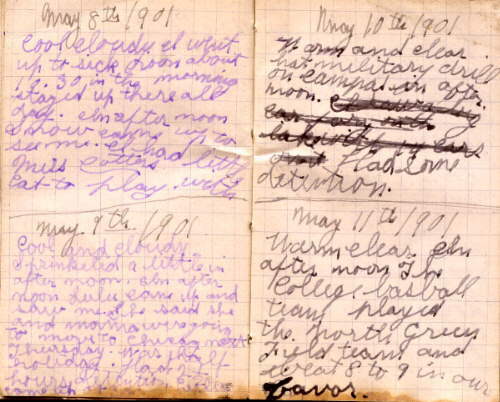 A small notebook or diary of John William Landis in pencil was found with the above diary of William Walter Landis. 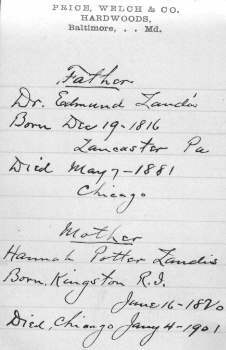 Though this 2nd diary was written by an older man (father of William Walter Landis), nevertheless its last entries were written at a later date. The diary is a 2"x3" leather-cased notepad with pages perforated for tearing out : 3 rear-most pages were missing. The notepad was a courtesy gift of Price, Welch & Co., Hardwoods and Mahogany, Canton Avenue and President Street, Baltimore. John William Landis owned the J.W. Landis Mill Company at 26th and Throop Street in Chicago. left at five in afternoon. 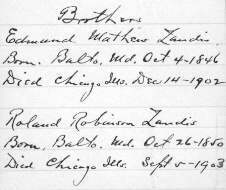 These entries followed by 7 pages of names and addresses of "friends met at Buena Vista Hotel", ending in 2 pages of birth and death dates, more carefully written . 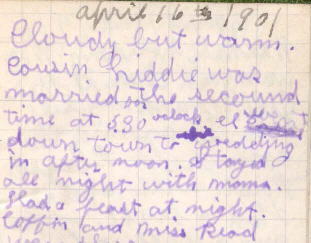 These dates could not have been written by the parents or siblings of John William Landis, since their death dates are listed : this post-1903 handwriting is quite different from John William's 1887 handwriting earlier in this diary, but the natural author of this information is John William Landis, and signatures in several books owned by John W. Landis match this handwriting. Five final pages were left blank. 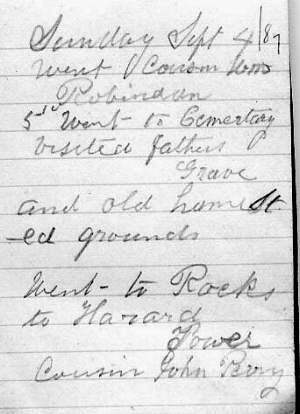 Note that the 1850 Maryland census lists another brother Thomas, age 2, who apparently died young and was not remembered in these notes?